State prison site since 1869. Original buildings completed in 1884. First supt., W. J. Hicks. New facility finished 1983. 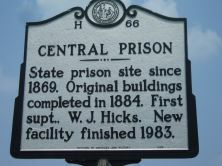 The North Carolina Constitution of 1868 authorized the construction of a state prison to address concerns about inconsistent and cruel punishment in county jails. Two years later, a twenty-two-acre site was purchased, and prisoners housed in temporary structures on the property began preparing the site for the prison. The Gothic style complex was completed in 1884 at an overall cost of $1.25 million. Among the master stonemasons hired to aid the construction was W. O. Wolfe, father of novelist Thomas Wolfe. The prison has undergone extensive change since 1884. In the 1940s a prison industries facility was developed to house a print shop and state license plate production center. In the 1960s an acute care hospital opened, followed by two mental health wings in the 1970s. 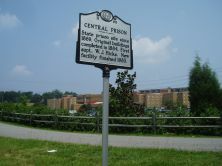 During the 1980s, the North Carolina Department of Corrections added additional housing and administrative areas with a $38 million renovation project, resulting in demolition of the massive Gothic edifice. A riot in 1968 resulted in the death of six inmates and injuries to nearly seventy more. The prisoners demanded the formation of a grievance committee that included inmates and the return of prisoners in high-security areas to the general population. In the course of the riot, the inmates burned several buildings and gathered a large amount of weapons. Central Prison’s infirmary and mental health wards presently serve the inmate population of the entire state. The prison remains the intake facility for all male felons over the age of twenty-two with longer than twenty-year sentences. The prison also contains the state’s execution chamber, deathwatch area, and men’s death row. Inmates work in the various production offices within the prison including prison industries, the kitchen, and laundry. In addition, inmates serve as barbers, janitors and clerks. Presently, the prison offers GED and college courses, substance abuse programs, and worship services.